Timeline of yearly U.S. overdose deaths involving heroin. US timeline. 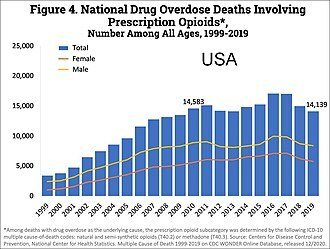 Yearly illicit opioid deaths. Number of deaths from heroin and non-methadone synthetics. 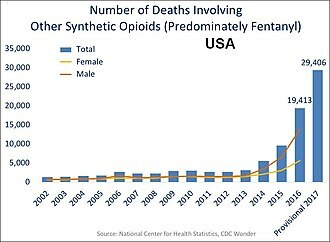 The latter category is dominated by illicit fentanyl overdose; when combined with heroin, these numbers capture illicit opioid deaths. Timeline of yearly U.S. deaths involving prescription opioid pain relievers. 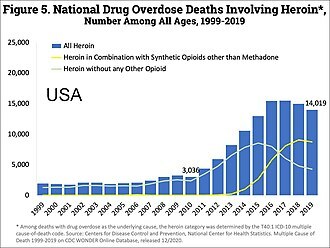 Non-methadone synthetics is a category dominated by illicit fentanyl, and has been excluded to more accurately reflect deaths from prescription opioids. 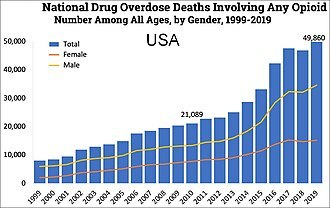 Timeline of yearly U.S. deaths from all opioid drugs. Included in this number are opioid analgesics, along with heroin and illicit synthetic opioids . Heroin-assisted treatment, or diamorphine assisted treatment, refers to the prescribing of synthetic, injectable heroin to opiate addicts who do not benefit from or cannot tolerate treatment with one of the established drugs used in opiate replacement therapy like methadone or buprenorphine (brand name Subutex). For this group of patients, heroin-assisted treatment has proven superior in improving their social and health situation. It has also been shown to save money, as it significantly reduces costs incurred by trials, incarceration, health interventions and delinquency. It has also drastically reduced overdose deaths in the countries utilizing it, as patients take their dose in a controlled, professionally supervised setting, and Narcan (naloxone) is on hand in the case of an accidental overdose. Opiate related overdoses in the U.S. kill around 20,000 people per year. Heroin-assisted treatment is fully a part of the national health system in Switzerland, Germany, the Netherlands, Canada, and Denmark. Additional trials are being carried out in the United Kingdom, Norway, and Belgium. The British have had system of heroin maintenance since the 1920s. For decades it supplied a few hundred addicts nationwide, most of whom were doctors themselves. It was de-emphasized considerably during the 1960s-1980s as a result of the U.S. led "war on drugs". Because of the lack of large-scale trials, only anecdotal evidence existed as to the efficacy of the treatment. This changed in 1994 when Switzerland, faced with one of the largest open drug scenes in Europe at the time, started large-scale trials on the potential use of diamorphine as a maintenance drug. They proved diamorphine to be a viable maintenance drug which has shown equal or better rates of success than methadone in terms of assisting long-term users establish stable, crime-free lives. These results encouraged countries like Germany and the Netherlands to conduct their own trials and finally to include heroin-assisted treatment fully as a part of the national health system in 2009. In recent years the British have begun moving towards the inclusion of heroin maintenance programs as a legitimate component of their National Health Service. In 2013 European Union's European Monitoring Centre for Drugs and Drug Addiction issued guidelines for the years 2013-2020; for the first time since the EMCDDA's 1995 inception, the group advocated "reducing the health and social risks and harms caused by drugs" in addition to longstanding policies of lessening demand and supply. Both the United Nations Office on Drugs and Crime and the Transnational Institute have released documents advocating harm-reduction strategies, though only the latter mentions heroin-assisted therapy. In 2008, the right-wing Swiss People's Party initiated a national referendum on heroin-assisted treatment. A significant majority (approximately 68%) voted in favor of continuing Swiss HAT programs. In the Netherlands, both injectable Diamorphine HCl as injectable salt in dry ampoules as well as Heroin base with 5-10% caffeine for vaporization are available, both are to be taken twice daily in a supervised setting and will be accompanied with a daily take home dosage of methadone for the evening. In Switzerland patients may be allowed to appear only once a day and receive part of their diamorphine in pill form for oral consumption. This is possible only after a six-month period and is usually granted only if necessary to hold down a job. Critics, such as the Drug Free America Foundation, have criticized heroin-assisted treatment along with other harm reduction strategies for allegedly creating the perception that certain behaviors can be partaken safely, such as illicit drug use, claiming that this may lead to an increase in that behavior by people who would otherwise be deterred. We oppose so-called `harm reduction´ strategies as endpoints that promote the false notion that there are safe or responsible ways to use drugs. That is, strategies in which the primary goal is to enable drug users to maintain addictive, destructive, and compulsive behavior by misleading users about some drug risks while ignoring others. Such shortcomings arguably exist with some "harm reduction" measures, such as supervised injection facilities. These facilities provide users with the information and equipment necessary to avoid infection with diseases such as HIV, but leave them dependent on the black market. So users still face the health risk associated with the injection of impure street drugs and they still face the enormous financial strain of financing their addiction. —  Nordt, Carlos, and Rudolf Stohler, "Incidence of Heroin Use in Zurich, Switzerland: A Treatment Case Register Analysis"
Also, the notion that patients in such treatment programs are enabled to maintain "destructive behavior" contradicts the findings that patients significantly recover in terms of both their social and health situation. A clinical follow-up report on the German study on this matter found that 40% of all patients and 68% of those able to work had found employment after four years of treatment. Some even started a family after years of homelessness and delinquency. ^ "Heroin-assisted treatment for opioid dependence: randomised controlled trial". Br J Psychiatry. 191: 55–62. July 2007. doi:10.1192/bjp.bp.106.026112. PMID 17602126. ^ "Canada now allows prescription heroin in severe opioid addiction". CBC.ca. Retrieved 27 November 2016. ^ "EMCDDA | Drug treatment overview for Denmark". www.emcdda.europa.eu. Retrieved 2018-01-22. ^ Siddique, Haroon (2017-03-05). "Durham police will give addicts heroin to inject in 'shooting galleries'". the Guardian. Retrieved 2018-01-22. ^ "Norway government announces plans to give heroin to 400 addicts". The Independent. Retrieved 2018-08-14. ^ Demaret, Isabelle; Quertemont, Etienne; Litran, Géraldine; Magoga, Cécile; Deblire, Clémence; Dubois, Nathalie; De Roubaix, Jérôme; Charlier, Corinne; Lemaître, André (2015). "Efficacy of Heroin-assisted Treatment In Belgium: A Randomised Controlled Trial". European Addiction Research. 21 (4): 179–187. doi:10.1159/000369337. ISSN 1421-9891. PMID 25832522. ^ "Long-term effects of heroin-assisted treatment in Germany". Addiction. 103 (6): 960–6, discussion 967–8. June 2008. doi:10.1111/j.1360-0443.2008.02185.x. PMID 18422829. ^ "Reducing the harm of Drug Use and Dependence" (PDF). ^ "Decriminalise drugs to meet users' right to good health, says UN official - United Nations Drug Control". www.undrugcontrol.info. Retrieved 2015-12-14. ^ The Lancet, Vol. 367, June 3, 2006, p. 1830. This page was last edited on 24 March 2019, at 23:13 (UTC).